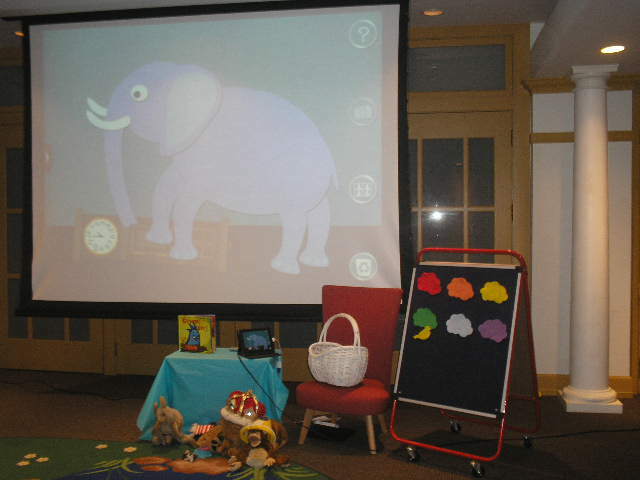 Beginning in December 2013, the Park Ridge Public Library in Park Ridge, IL, began offering an iPad storytime called eStorytime. As of the date of this posting, we have had three sessions of eStorytime; each of which has been more successful than the one before. The program is a mix of traditional picture books, felt stories, puppet and prop stories, and early literacy apps on the iPad. We began this program as a means to introduce parents and caregivers to a variety of apps and stories while also modeling how to utilize them effectively with their own children. Our setup has been very minimal so far with the iPad hardwired into our projector. 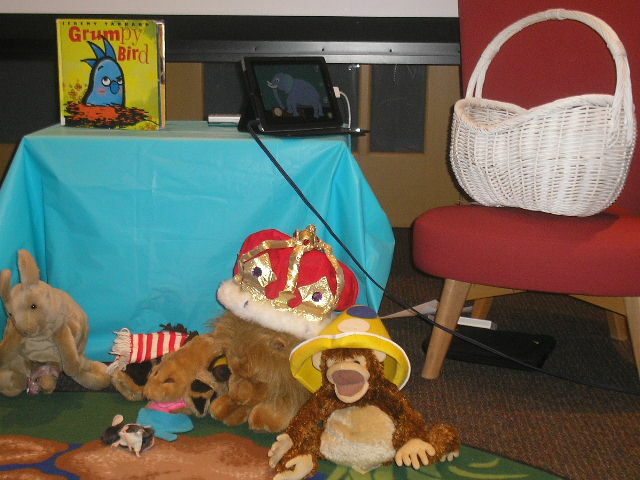 Since I do not typically move around too much during storytime, this setup has met our needs fairly well. However, in the future, it would be nice to go wireless. Our room setup is essentially the same as it is for our other storytimes with the addition of the screen on which to project the iPad. We have a small table and a chair for the storyteller, a storytime rug, and a few chairs set up for adults. Along the side of the room we have early literacy information for caregivers as well as copies of the stories we will read and some other books that might be of interest. This is particularly helpful when we read an eBook for which I can put out a physical book as well to show the relationship between the two formats. We offer the program for all ages on Monday afternoons at 1:30. Typically we get a younger crowd (2-5 years old) unless school is out that day. Because it is offered for all ages, however, I try to over plan with a variety of stories for both older and younger kids and then make the call about what to read on the fly based on the current crowd/mood. So far, I have been very pleased with this storytime. The kids seem really seem to enjoy it, and it has been a blast for me to plan as well. Ultimately, my goal is to incorporate digital storytelling into standard storytimes like any other story format as a means of further enriching the experience. Below is a list of the stories we have done so far, both traditional and app-based. • Pete the Cat School Jam (HarperCollins Publishers) – While reading the book, I used the “bonus” part of the app which allows you to utilize the iPad’s video camera to project a live image of the kids up on the screen with a Pete the Cat border and some accompanying tunes so we could all sing along with Pete. 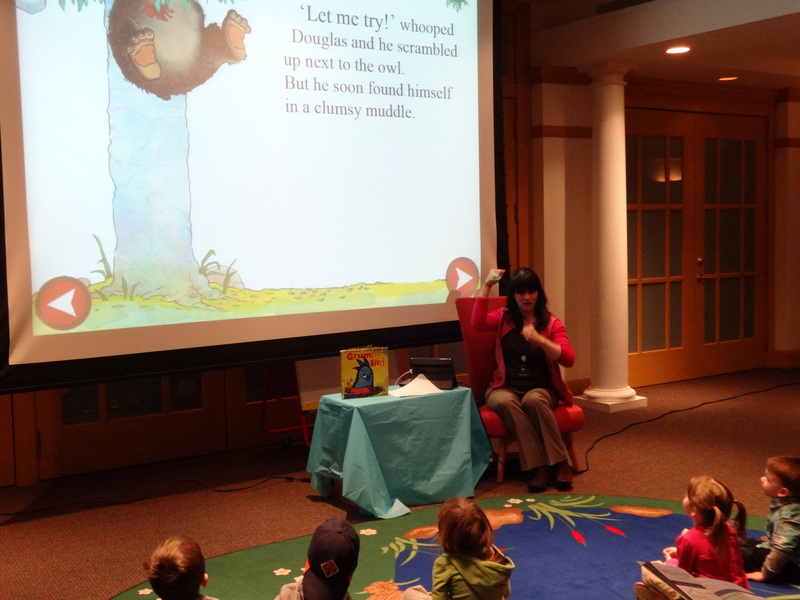 Staci Greenwald is a Children’s Services Librarian and School Services Coordinator at the Park Ridge Public Library in Park Ridge, IL. Posted on May 30, 2014, in Apps, Story Time and tagged Staci Greenwald. Bookmark the permalink. 1 Comment. omg I love grumpy bird!